Let’s start with this: A lot has happened since I last wrote. I don’t mean a lot as in someone saying they ate a lot after having a second helping of a good meal or when another person says they did a lot of walking following a five-mile hike. When I say a lot here, I mean it as a bold, stark understatement. I mean the kind of a lot that would convey brimming over, filled to the top, or having NO capacity for anything else. A lot in this context means there is literally no way that I will be able to get all of what has happened on this blog. But just know. A lot has happened. So, where to start? Well, music, of course. It has come to my attention that many people have been unable to listen to my music clips the last few months, and through trial and error I have concluded this is largely due to the fact that this site’s music player only works on Firefox. Knowing that not everyone uses Firefox and in an effort to create the best blog-reading experience as possible, I have switched to another music widget. Hopefully, it works for everyone. You should be able to download the song by hitting the arrow on the right of the player and streaming should be better for everyone. In case you are wondering, I learned this from Michaela (aka Mak, Mak Attack, Makintosh Computers, MakDonalds, MakFace, or Makaroni and Cheese) who has recently unveiled her own wonderful blog that is well worth a visit or two or eight. If I remember correctly, we left the story off when I was last at the farm in the Czech Republic. I concluded my time there feeling rested and thankful for the opportunity to work with my hands and have time to process everything that had happened. I left with my love of the Czech Republic, chopping wood, and reading by one light underneath the covers as strong as ever, my pocket a bit lighter from losing at poker to Rich and Katie, and my hatred for doing the dishes at an all time high. I remember feeling a bit disappointed that I hadn’t seen any Czech snow, as some of my finest memories from being there in 2006 was from it dramatically snowing in the way that brought out anticipation in every flat place in the city and made the quietest of streets just a little bit quieter. But sure enough, my last night, after having an impressive homemade curry that made me forget how cold it was outside, someone muttered “I think it’s snowing,” and upon double checking on the porch, it sure enough was snowing just slightly. 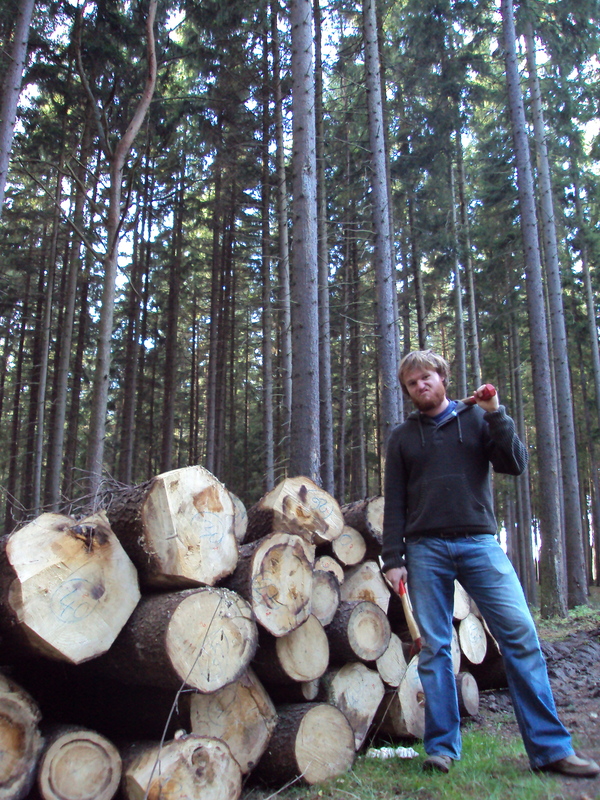 As you can tell, I am almost single-handedly responsible for the deforestration of a whole Czech forest. 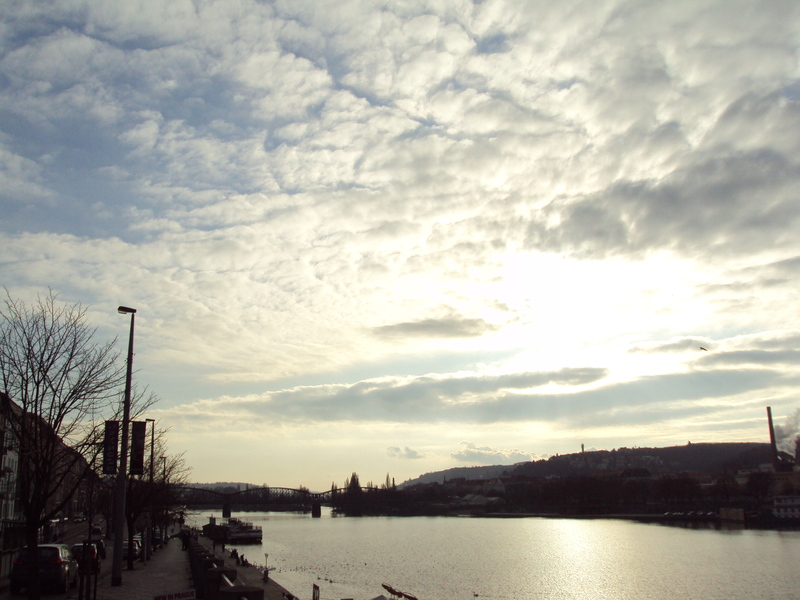 The next morning I made my way back to Prague with high hopes of my second stint in the city in as many weeks. The first day was spent and felt much like my brief stay their before the farm, familiar but only in a nostalgic way. Despite a visit to the Communism museum (where I had never been before) and the celebratory and slightly subversive way the sun was shining even though it the beginning of December, I still felt much like I was knocking at the door of the city, not being able to fully access it in the intimate way I knew it when living there. 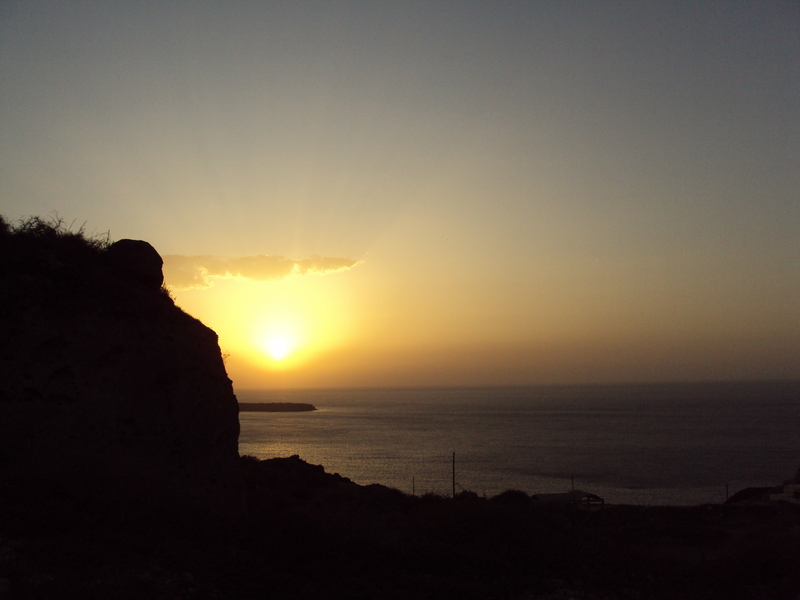 Here was what I brought with me from Greece as a present for the Czech Republic- sunlight. I could barely get it through customs but it was worth it. It wasn’t until I met up with Katka that Prague opened its door fully and let me back in. Katka is a dear friend I made back in 2006. 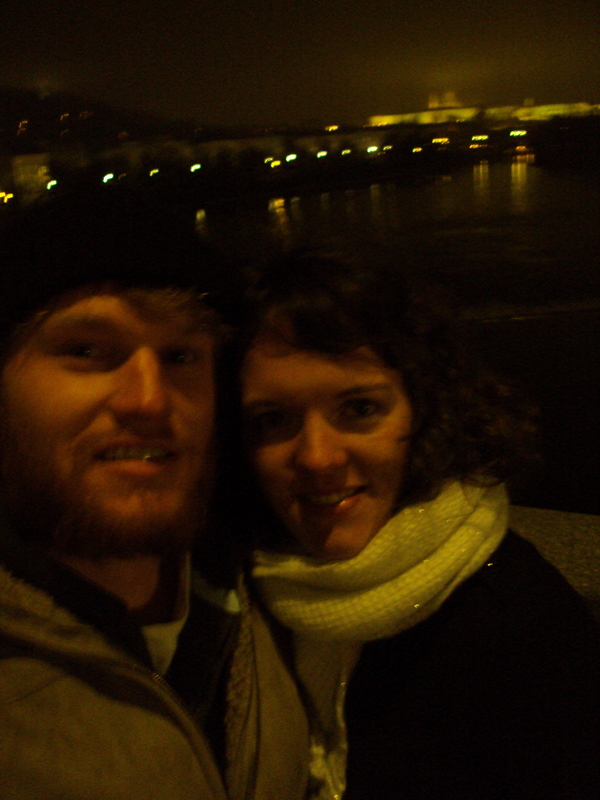 With the exception of a stop at her parent’s flat and a viewing of the classic Czech film “Closely Watched Trains,” our relationship back then mostly consisted of meeting up in the cold Prague night and just walking and talking. Walking a lot and talking a lot (see above description of a lot) in ways that makes a city your own as it yields its finest secrets- little cobbled side streets, views of the city that literally move you backwards in your steps, or the sounds you might have missed in the noisy, busy daylight. And there we were, just like we had been almost four years ago, and feeling like we were the only people in Prague walking and talking. I was madly in love with Prague again, intoxicated by the lighting and the cold air and happy to be with an old friend after spending the two or three weeks prior very much in my own head. The only photographic proof that Katka and I are friends. That night feels significant on many levels because it felt like for the first time many of my thoughts on where I was going and the places I was coming from became clearer, not concluded but clearer. It was as if I had been lost and then suddenly found myself on a map. I still wasn’t sure where I was going but at least I knew where I was. And it should be noted that as a taxi took me to the airport, it started to snow. A lot. It is here where I would put Greg Brown’s song “Every Street in Town,” but I only have a copy I bought on iTunes and it won’t let me do that. Reason #1 I don’t buy anything from iTunes anymore. This will have to do. I’ve been listening to this over and over recently on trains and buses and just being taken by how beautiful it is. After catching my plane and leaving the Czech Republic, I arrived in London, once again staying with Jack but this time having two other great friends, Ellie and Debbie, to visit. Here are things that every visit I’ve had with Jack involve: good music and good food. There are no questions about these two things and within the first night we had gone to one of the best restaurants in Central London and listened to the Dirty Projectors on vinyl. The next day we took a trip to a British beach town which I for the life of me can’t remember the name of and I ask Jack about once a day. Sorry, blog. 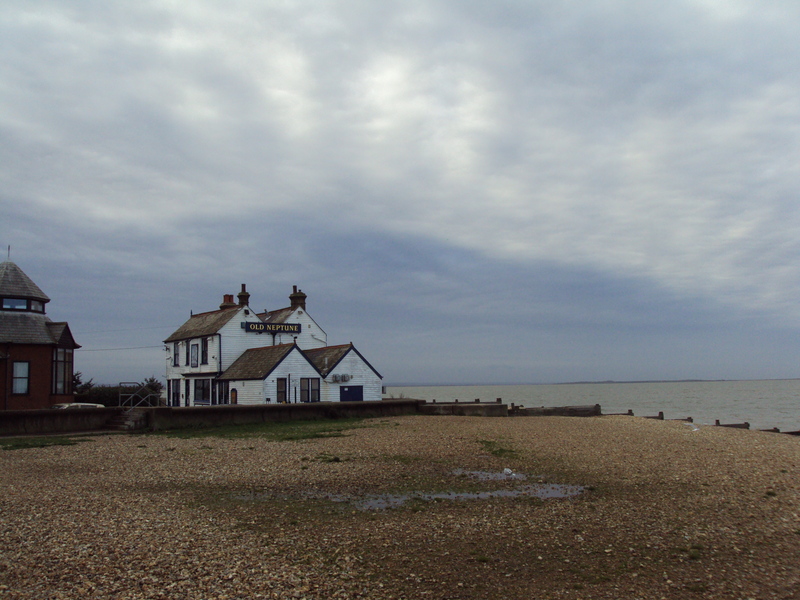 The English seaside, the English pub, and the English sweet touth- English traditions I was able to adopt immediately. The next day is when things started to get crazy and when you start to understand what I mean by “a lot.” I boarded a EuroStar train, which takes passengers under the English Channel and to Paris and/or Brussels. 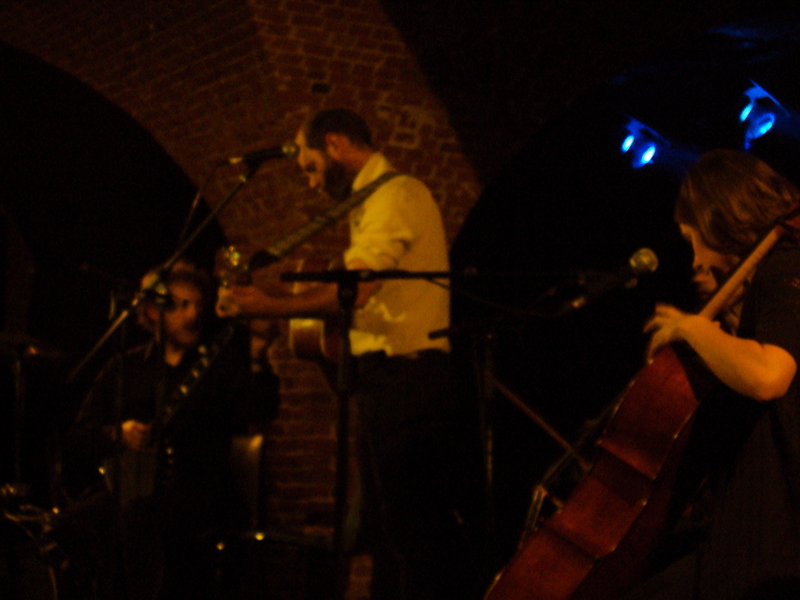 I made my way to Brussels with the goal being to see Horse Feathers in concert. According to my Last.fm page, Horse Feathers is my most listened to artist by a long shot, so that is saying something. The perk of seeing Horse Feathers in Brussels is…well…being in Brussels. I had been warned on more than one occasion that Brussels wasn’t very beautiful and might not be worth my time but this couldn’t have been more wrong. I took to the city right away. It had a way about it, an honesty, that I don’t sense from many cities, particularly ones that I am just passing through. It wasn’t beautiful, though it had beautiful things in it. It just was and it felt like the city and its citizens were ok with that and you had the choice of either taking it or leaving it. I, wisely, took it. I walked around the city center at night before the concert, enjoying the fact that families were out and also enjoying the city and not just tourists. I stopped in a cafe famous for chess being played there at all times, and sure enough I was able to watch a few games of speed chess by guys who were profoundly better than I currently am. The Horse Feathers concert was incredible. Simply put. And the Belgian crowd was the greatest concert audience I have ever witnessed in my life. Horse Feathers was firing on all cylinders; their harmonies and arrangements were perfect, his voice was better in person than on the record, and they closed by coming out into the crowd and playing acoustically with everyone sitting quietly around them. While much could be said about Horse Feathers, and I had good conversation with three of their four members after the show, the star of the evening was the Belgian crowd. Forget Belgian waffles (which I had and was blown away by), Belgian chocolate (also enjoyed), or being the capital of the EU (despite this, ATMs could not be found anywhere in the city, especially not when I needed them), I want Belgian music fans in my life all the time. The was a silence in the underground venue that was charged with an energy that was distinctly directed at the performers. The artist’s silences where exactly that- silent- and their music competed with nothing at all. I realized that in such a context a musician is no longer just playing music but rather they are filling a space with themselves, with their ideas, with their art, and that energy just pulls everyone towards the artist as we hang on their every note and, much more importantly, on their every silence. Are you seeing what I mean by a lot yet? So, I took the train back after a morning of more exploring in Brussels where I found an antique post card shop, a whole building decorated in Chinese lanterns, and numerous groups of school children that made me wish I was able to take my students to Europe with me. Maybe I will just yet. At this point, I’m starting to feel the weight of “a lot.” I’m feeling overcome by the beautiful things, places, and people in the world and feeling almost frustrated that I can’t experience it all and contemplating not sleeping anymore so I can do more things (ask people who know me well- family, coworkers, roommates- how good of an idea this is. It’s just terrible.). I arrive back in London, take a shower, and immediately head out to meet Ellie to see none other than…Horse Feathers. If there was any doubt that incredible relationships transfer from the bookshop to the outside world, this has been shattered by my friends in London by this time. Despite electrical problems that kept the house lights on and the stage lights off, Horse Feathers played beautifully again. Once again, the European audience surpassed even my greatest expectations of an American concert crowd, and they once again were able to venture out into the crowd for an acoustic encore. By now, the term “a lot” is ceasing to even be in the ballpark of appropriate. We ended the night by walking down Brick Lane, having a beer at a wonderful bar that made me think, “Alright, London, that’s where you’ve been keeping your secrets,” and having wonderful conversation. The next day Ellie started to check things off a Whimsical To-Do List. We marveled at the British Museum and explored the wing completed dedicated to clock making. Just a lot of clocks. I need you to understand that I haven’t even met up with Debbie at this point, and when I do shortly after leaving the British Museum, she took me on a quick whirlwind of her neighborhood which included Rough Trade records where I was so overwhelmed I just had to ask to leave, a ukulele shop, and grocery shopping. A lot? I would say so. We went back to her flat and played chess on a board that we made right there and then we had dinner with Ellie and a group of their friends who were some of the best dinner company one can ask for. Have you even made it this far? If you have, you must surely be agreeing that “a lot” has happened, and its not even close to ending. Do you need to come back in a bit? Don’t. Stick it out. The next morning Ellie took me to a meditation class and I realized how much I could probably benefit from meditation in terms of being present, focusing, and calming down. We met with Debbie and had lunch in a cafe that should submit itself in the “Cafe most likely to be called perfect and then be featured in a charming romantic comedy movie” contest. I could’ve gone to sleep at this point and had enough whimsy in my life to sleep into 2010, but Debbie then took me to a farm…!! !…in the city, and we ate gelato and hung out with the goats and Debbie didn’t even make any jokes about my beard when we happened upon the “Ginger Pigs.” That night, Atlantis Books worlds collided as Jack met Debbie and Ellie, and guess what we talked about? A lot of stuff. 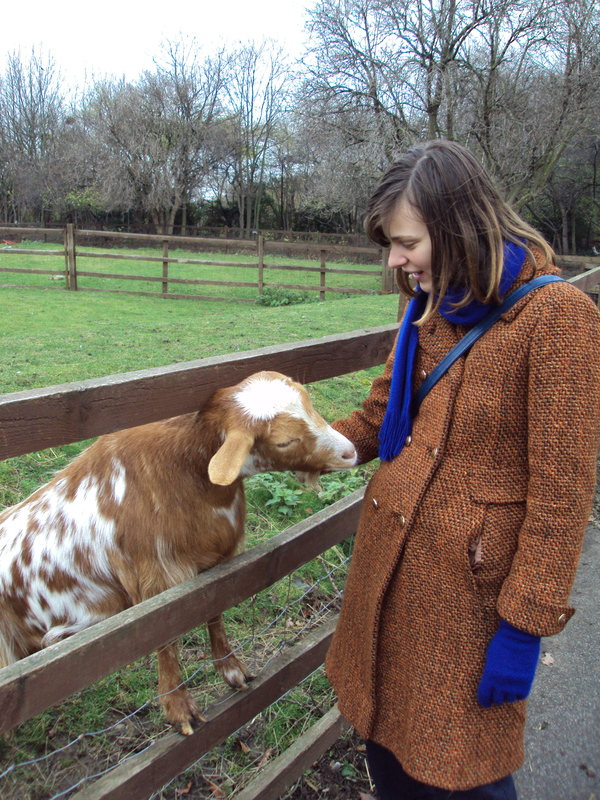 Debbie was in love with this goat and showed it through repeated praise and petting. 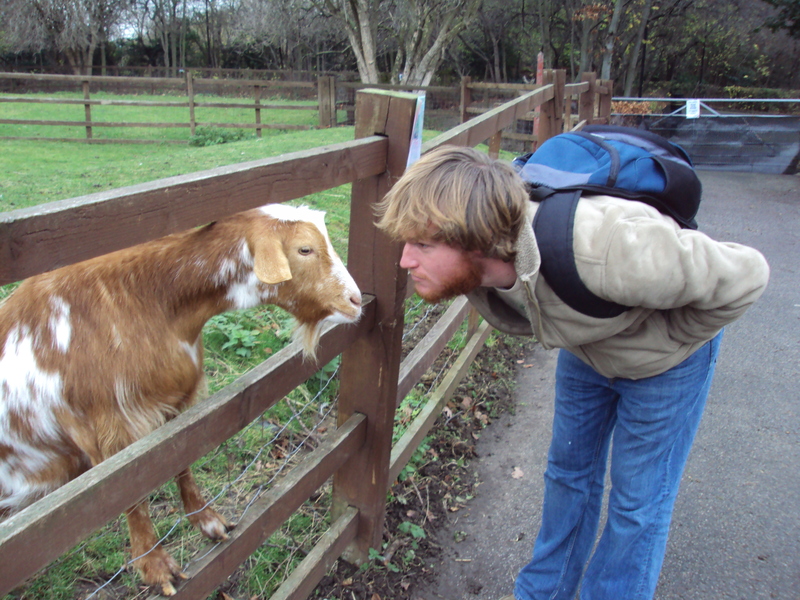 I showed my love for the goat by getting in its face and making fun of its biggest fears and insecurities. I rose the next morning and caught a train to Sheffield, England, which if you don’t know is in the North of England and is the fifth largest city in the country. Pete met me at the station and we started doing- yep, you guessed it- a lot, and here I mean a lot in the way that there was so much goodness around me and so many new experiences that I just stored them away as if I was a bear about to go into hibernation. Here is a fashion of "Where's Waldo?" 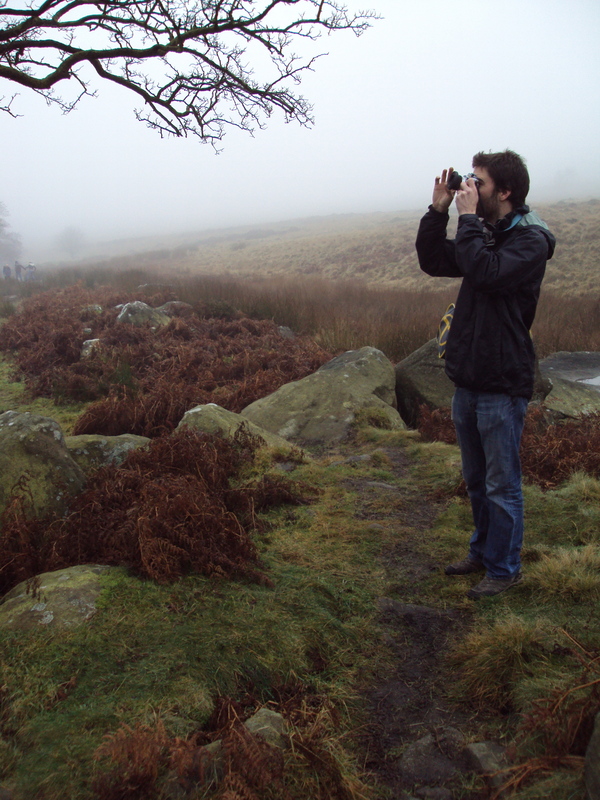 that some people think is too easy, its called "Where is Pete in this photo?" Next post we will use this same picture for another game called "Guess what Pete is doing in this picutre." I like my readers to feel successful. Now, understand, Sheffield is not at the top of people’s tourist list of places to visit in the way that Prague or London might be, so, as has often been the case in my travels, I found myself feeling like I was in a secret, but the only thing about this secret is that the people who lived there were well aware of the secret. I have been few places in my life where I experienced such hospitality and witnessed the way people take pride in where they live as I did in Sheffield. Not only was Pete letting me stay in his house, wear his coats (I left mine in London), eat his food, follow him around, and meet all his friends, but his friends all had distinct ideas of what I should do while in their hometown. But instead of just recommending things to do like most people would, they went the extra mile to ensure I did it right. I liked this. A lot. When Neil thought I should be be able to go for a car ride through the country side, he came and picked us up himself and took us driving to a near by village for a gentleman’s brunch. When Kate told me to try geribaldi biscuits and read Ted Hughes, she bought them herself and brought them to me. It is here I learned just how much of a difference being hospitable, going an extra mile for a stranger, and just generally following through with the things you talk about can make a huge difference in others’ experiences. Meeting all these people, feeling so welcome in their home, and sharing a part of their life was one of the most affirming experiences I have had in a long time, and is the exact epitome of what I blogged about all those months ago about meeting new people, planting seeds for friendships in your little garden of life, and hoping for the best. Pete and I walked the countryside and ate chipbuttys (which I just cannot say correctly no matter how hard I try) and had what was simply called a “pint of tea.” We enjoyed excellent beer as often as possible and listened to excellent music. A lot of all of this, and I concluded that whether or not I return to Sheffield in my lifetime, it will always hold a dear place in my heart. I present the Chip Butty, a northern English treat that gives the New Orleans po boy with fries as the most carbo loaded sandwich ever. This sandwich, it should be noted, was ridiculously delciious with that English brown sauce and a pint of tea. Another thing that happened in Sheffield is that Pete’s roommate Rosie opened a photo exhibition at Pete’s bookshop/coffeehouse called The Rude Shipyard (which is an incredible space). For the event, I was asked to open for Pete as the music for the evening. This was the first time I had played a proper gig as such in well over three years or so and the first time I had ever played by myself in this way, and I must say, I loved doing this and for the first time in my life I didn’t feel like I was just playing music but I was filling a space with myself and my ideas and I felt an energy as people listened and I felt the weight of respect in my silences. It was a really special evening and yet another reason to love Sheffield. Wow. This is a lot. I’m impressed you’ve made it this far. I’ve returned to London and find myself yet again blown away by the new friendships I’ve made as I feel the power of this great city below me, around me, and towering high above me. London is such a big city that having three great friends in the city means that you see three incredibly different worlds. Ellie’s ability to continually come up with whimsical adventures is similar to Mary Poppin’s ability to pull objects out of a hat- the goodness just keeps coming. Debbie knows the coolest places in the city it seems and, blog, you need to know, that she beat me at chess today and Ellie has decided she is ready for the world championships. Jack’s work in the classroom and at his school as he rises every morning at 5:45 is inspiring in ways that have me missing teaching more than ever, and after he took me to my first Pantomime at his school (which I will add next to tea time and free museums as something that Americans have really missed the boat on) I was as inspired as ever. So, here it is. Walking through the city and seeing Christmas decorations, walking through the London snow today, and seeing a performance of Handel’s Messiah in the British Library have made me realize it’s Christmas. I leave for the US on Friday, meaning tomorrow is my last full day in Europe. What this means exactly I still don’t know. I can’t tell you if my journey is over or not in the way John Steinbeck could at the end of his journey. I can’t tell you what I’m doing next and I can’t quite verbalize the ways I’ve changed and grown. What I can do, though, is remember why I chose this path in the first place. I refrain from using the word “expedition” here or adventure because as I just read in “Lady Chatterly’s Lady,” an expedition hints that you will be returning home. In a way, I suppose I am in that I am going home, but I don’t feel as if I will be returning anywhere. Despite physically returning to somewhere, I feel myself moving forward in so many more ways. I’ve don’t a lot to say the least. I’ve seen a lot of beautiful places and met a lot of beautiful people, and I use “a lot” in the way that you might say that Dikembe Mutombo had a lot of blocked shots in his NBA career (he had 3,289). I learned a lot and had a lot of new experiences, and I mean that in the way that you might say Bob Dylan has released a lot of albums (according to iTunes, there are 77 of them including greatest hits compilations). More than anything, I’m thankful. A lot. Happy music for safe travels. Talk to you from the US. 1) You DID do a lot, but I would not expect anything short of A LOT. 4) Thanks for the shout out. 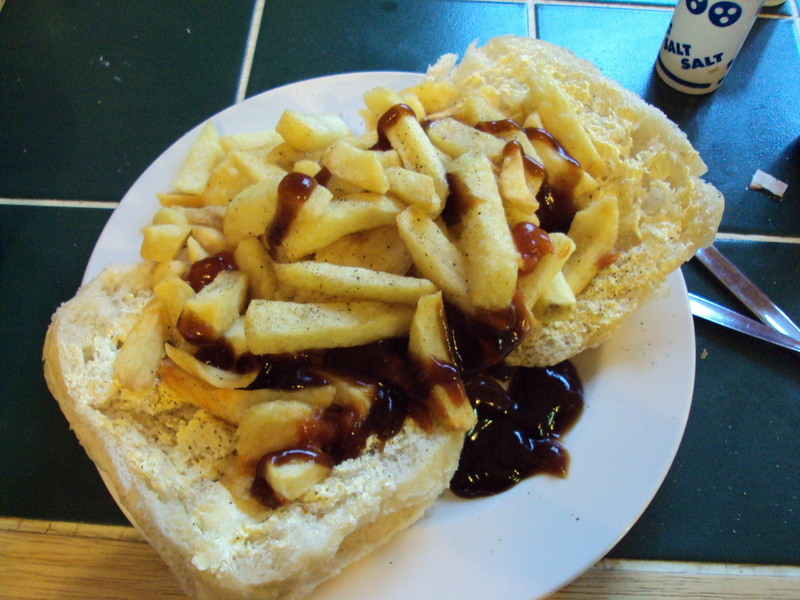 5) is that brown sauce on your Chippywhatsit? Because I want some, NOW. Your words are lovely, and so it your music, I am glad soundcloud has another new friend. I miss all of you so much that words could not even describe it, so I won’t try. Thanks for taking the time to tell us about your adventures. Awesome. You best get yourself back to Sheff someday! I’ll definitely be over sometime soon. come and live in sheffield soon. i’m sorry we didn’t get to say bye and that your visit ended in a car crash (both physical and metaphorical for me) but hopefully only physical for you. the bookshop beckons me… as does new orleans. so you never know, one day we may all sing and play guitar together again. I wish I could download your abroad experiences into my brainspace. What a beautiful way to return to the leisurenet. James, I miss you all kinds. I’m already planning a trip to New Orleans for September with one of my Atlantis 2008 companions (like Jack, the worlds can collide again…) and I hope to heck that you’ll be there. OR that you’ll come back next summer to star in my overheard show if they let me do it. This is one of those instances where I feel an expletive would be most appropriate as a modifier, but perhaps it’s not a good internet idea. Let’s just say this… I ___ing love the way you live life. Also, tutored a very bright 11 year old today for money, played some chess with him (he’s on the chess team, we called it a draw, but geez) and thought of you as my teaching-an-11-year-old inspiration. Well, you and Bill Murray in Rushmore. He talks to kids like they are grownups but more with it. That seems best.